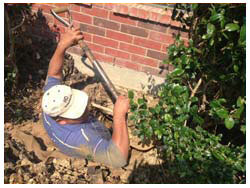 Get HD Foundations For Foundation Repair In Mesquite. We’re Contractors That Offer Solutions. Why Foundation Repair In Mesquite? The primary reason to have your foundation fixed is to alleviate ongoing foundation damage. Allowing your valuable property to deteriorate is never a good idea. At HD Foundations, we’re experienced contractors that are known for offering Mesquite property owners foundation repair solutions to foundation cracks and other complications. If sinking, sloping or settling is a concern, that’s trouble we can handle. It’s far less costly to deal with foundation problems while they’re still relatively small. 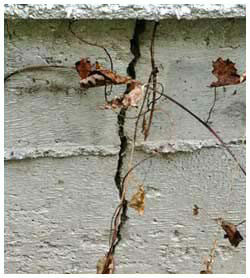 Over time your foundation will become increasingly more out of level and pose safety concerns. The key is minimize foundation crack damage. As experienced foundation repair contractors in Mesquite, HD Foundations frequently installs concrete piers aand steel foundation piers that will make your structure even. They’re a great solution because they work extremely well and prevent your foundation from moving. To find out more, just give us a call. We do it by taking the proper steps to lift your house or other structure correctly. 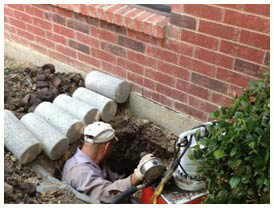 The first thing we do is excavate around your foundation in order to install piers. Then we elevate your house or building and put it on top of the piers. This prevents cracks in concrete slabs and is the answer to foundation repair problems. It’s done by Mesquite professionals like HD Foundations regularly. When servicing pier and beam foundations, we make our repairs in much the same way, although there are some distinct differences. Regardless of which type of foundation you have, it’s important to avoid foundation repair mistakes. That’s because errors can prove costly and you’ll want things done right the first time. The solutions we offer are effective and long lasting. The fastest way to find out whether you have foundation damage and require professional service is to ask HD Foundations in evaluate your structure. So why delay? It’s easy to schedule a free foundation repair estimate in the Mesquite area online today, and get an inspection on your house, apartment or commercial building.